Named one of the 100 Women Leaders in STEM by STEMconnector, Tricia Berry leads efforts to recruit and graduate women in the Cockrell School of Engineering as director of the Women in Engineering Program at The University of Texas at Austin. She concurrently serves as collaborative lead for the Texas Girls Collaborative Project, leading the dissemination of STEM best practices and informal curriculum across Texas in coordination with the National Girls Collaborative Project. Through both roles, she connects and supports organizations and individuals working to advance gender equality in STEM fields across Texas and beyond. Berry is also co-founder and executive vice president for 825 Basics and the co-author of "You Can’t Eat Your Degree: Combine Your Passions and Philosophies to Create the Story of Your Future" and "Exceeds Expectations: Take Control of Your Performance Review." Previously, Berry worked as a process engineer and a product development engineer at the Dow Chemical Company in Freeport, Texas. Berry received her B.S. in chemical engineering from The University of Texas at Austin in 1993 and her MBA from the University of Houston-Clear Lake in 1999. Berry is a Society of Women Engineers Life Member and a member and past president of the Women in Engineering ProActive Network. In addition to the STEMconnector recognition, Berry has been recognized for her efforts in gender equality and STEM with the 2011 SXSW Interactive Dew Winburne Community Service Award, 2014 Girl Scouts of Central Texas Women of Distinction Award, 2014 WEPAN Founders Award and 2014 Skillpoint Alliance Unlocking the Potential Award. Ana Dison is the assistant director of the Women in Engineering Program and coordinates all current student programming, including the First-Year Initiative, Kinsolving Learning Community, WEP Leadership Seminar, Graduates Linked with Undergraduates in Engineering (GLUE) research program, the Peer Assistance Leader program, Consider Every Option dinners and the Women In the Second Year of Engineering program. She typically teaches three to four classes each semester, including the WEP Leadership Seminar and the GLUE undergraduate research seminar. She led efforts to create a partnership with the UT College of Natural Sciences to develop and deliver bias and inclusion workshops and trainings across the university for students, staff and faculty. Dison supervises full- and part-time staff and oversees the business and personnel operations of the office. She joined the WEP office in 2006. Dison earned her bachelor's degree in kinesiology from The University of Texas at Austin in 1992 and her master's degree in college student services administration from Oregon State University in 1994. After working for two years at the University of Maryland in recreation services, Dison returned to UT Austin in 1996 and served as assistant director in the Division of Recreational Sports, coordinating membership services and satellite facilities as well as overseeing a large part-time student staff. She joined Texas Engineering in 2000 and served as an academic advising coordinator in the Engineering Student Services office, advising thousands of students and coordinating a wide variety of student programs. Additionally, she served as the degree evaluator for the Cockrell School for four years. Dison has served on numerous committees across campus, has been president of the Academic Counselor's Association and served for three years in the inaugural group of the UT Staff Council. Dison co-chaired the Provost's Council on Student Advocacy for three years and has served two terms as president of the Academic Counselors Association. She continues to be active in the UT Austin community, working with peer and professional mentoring programs. She has presented to numerous groups on a variety of leadership, inclusion and career-focused topics. A member of the Women in Engineering ProActive Network (WEPAN) since 2006, Dison completed a two-year appointment to the WEPAN Board of Directors as communications director in 2015. She received the Cockrell School of Engineering Staff Excellence Award and the Eyes of Texas Award in 2011 and the university's Outstanding Staff Award in 2012. After serving 20 years as a high school volleyball official in the central Texas area, Dison retired from the Texas Association of Sports Officials in 2011. Since 2003, she has been designing and creating custom jewelry and loves to golf in her spare time. Amy Beebe is the student program coordinator for the Women in Engineering Program, working on programming for current students. She assists with the recruitment, training and management of WEP’s Peer Assistance Leaders and assists with the management of the WEP Leadership Collaborative student organizations. Beebe earned her B.A. in psychology from The University of Texas at Tyler. She previously worked as an event coordinator for UT's College of Natural Sciences Honors and Student Life office before joining WEP in December 2017. Beebe has been an active member of the UT Hispanic Faculty and Staff Association since 2015. She is currently an advising program mentor for Con Mi Madre — a nonprofit organization that helps young Latinas graduate high school and prepares them for post-secondary education. Beebe enjoys spending time with her dog Jenny and trying new restaurants in Austin. 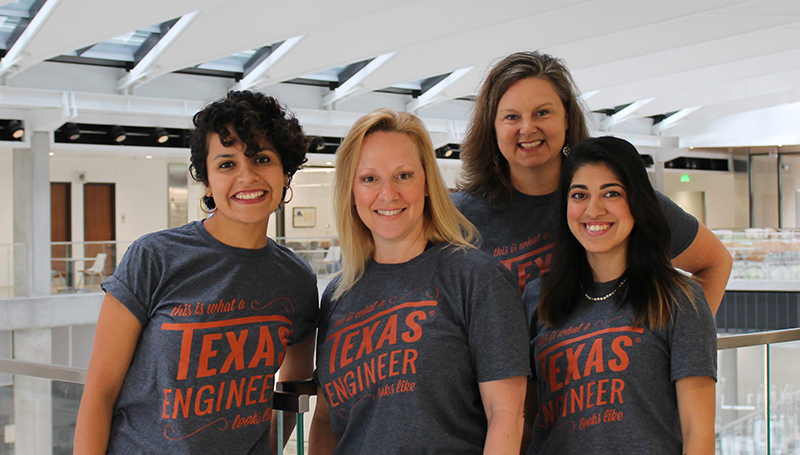 As the outreach program coordinator for the Women in Engineering Program, Andrea Herrera Moreno works with the K-12 education community to inspire more girls and young women to pursue engineering degrees at The University of Texas at Austin. She is passionate about WEP's outreach programs, including Girl Day at UT Austin and the immersive, hands-on programs for high school students in the summer. Originally from Mexico City, Herrera Moreno has lived on three continents and moved to the United States for college. She earned her B.A. in international political economy from Colorado College and is currently pursuing a MicroMasters in data, economics and development policy from MITx. As the administrative associate for the Women in Engineering Program, Susan Stanford processes accounting documents, voucher payments, travel documents and serves in various other business functions for WEP. She also works part-time for the Equal Opportunity in Engineering Program office in the Cockrell School of Engineering. Stanford attended UT Austin and previously worked as an advisor in the Department of Civil, Architectural and Environmental Engineering for several years. Her favorite color is purple and she loves queso.